The ForeclosureGate scandal poses a threat to Wall Street, the big banks, and the political establishment. If the public ever gets a complete picture of the personal, financial, and legal assault on citizens at their most vulnerable, the outrage will be endless. ForeclosureGate represents the sum total illegal and unethical lending and collections activities during the real estate bubble. It continues today. Law professor and law school dean Christopher L. Peterson describes the contractual language for the sixty million contracts between borrowers and lenders as fictional since the boilerplate language names a universal surrogate as creditor (Mortgage Electronic Registration System), not the actual creditor. Other aspects of ForeclosureGate harmed homeowners but the contractual problems that the lenders created on their own pose the greatest threats. When the Massachusetts Supreme Court upheld a lower court ruling that the actual creditor must named in the mortgage agreement (a legal requirement that the banks forgot to meet in their contracts), there wasconsternation on Wall Street. What would happen if a class action lawsuit challenged these flawed mortgages? Isn’t the Massachusetts decision the latest of many attacking the legal basis of the shoddy business practices and boilerplate industry contracts? What if homeowners started walking away from their underwater mortgages based on the legally flawed contracts? If there were a viable prospect of a class action suit against financial institutions threatening to invalidate these contracts, wouldn’t that crash the stock values of the big banks and some Wall Street firms? The big banks and their partners on Wall Street need a preemptive strike to derail the legal process that threatens their existence. They may get a temporary reprieve through pending consent decrees from the United States Department of Justice and consortia of state attorney’s general. If that protection fails, big money will make every effort to buy a bill from Congress that absolves them retroactively, en masse. The consent decree might cost them a few billion dollars. That’s much better than owing the trillions in lost home values due to their contrived real estate bubble and stork market crash. tial; background-repeat: initial initial; “> The surface scandal is about fraudulent business practices and a systematic assault on homeowners by lenders, servicers, and the legal system. A much broader picture must be viewed in order to understand the utter contempt that the ruling elite has toward citizens and the depraved tactics used to express that contempt, all to serve endless desire to accumulate more money and power. The set up began when we heard about the ownership society in the 2004 presidential election. President Bush defined ownership as taking the government out of our lives so more people could own homes and control their destinies. The foundation was home ownership. As Bush said on the campaign trail, “We’re creating a home — an ownership society in this country, where more Americans than ever will be able to open up their door where they live and say, welcome to my house, welcome to my piece of property” October 2, 2004. Freddie Mac, Fannie Mae, Wall Street and the big banks provided the back room. Mortgage Backed Securities (MBS) derivatives were vastly expanded. This made it easy for more home buyers to qualify for mortgages they might not otherwise get, credit standards dropped. Those with good credit saw an array of tantalizing zero interest loans and other mortgage products to maximize available cash and feed the stock market. The real scandal is the unfathomable loss of wealth and opportunities by the vast majority of citizens and the vicious attack on the most vulnerable citizens as a part that process. The attack continues and is worthy of review. Foreclosure is the down side of the ownership society. When you’re sold a bill of goods, a property that you were told you were qualified to buy, and you lose it, you are evicted from ownership island. Before Congress passed the 2005 bankruptcy reform act, homeowners could avert foreclosure in many states by filing for bankruptcy. Not just anyone could qualify. The process of qualifying was difficult and, oftentimes humiliating. But homes were saved and families were preserved with a chance to start over. A myth emerged of the bankruptcy abuser, a high-class sort of welfare cheat. These reckless people worked the system to rack up large debts that were subsequently wiped clean through bankruptcy. The alleged abuse of the system became the excuse for a major overhaul of bankruptcy law. The legislation passed the Senate with 74 yes votes and soon became law. The changes since the 2005 legislation provide substantial benefits to creditors. Morgan et al summarized the direct benefits to creditors in a forthcoming publication in the New York Fed’s Economic Policy Review. Before bankruptcy reform, the filer of a bankruptcy claim used to determine Chapter 7 or 13 filing status. That makes a difference in the amount and type of debt relief. The legislation imposes means test that determines precisely which chapter (7 or 13) filers must use. Significantly, chanter 13 filers retain more debt from medical and other unsecured credit. Legal costs ranged from $600 to $1500 before bankruptcy reform. Legal fees now range between $2800 and $3700. Previously, there was no requirement for credit counseling prior to filing. Filers must now document approved credit counseling six months before filing or face dismissal of their case (Morgan et al.). This counseling requirement can lead to unwarranted dismissals or inordinate delays in filing at a time when filers need relief. Under the old law, only bankruptcy trustees appointed by the federal court could file claims of abuse by the filer. Under the new legislation, anyone can file a claim of bankruptcy abuse, which can lead to a dismissal of the cause. This is a huge benefit to lenders who wanted to keep citizens from realizing debt relief. The new law makes it harder to file a claim, doubles costs, and gives the creditors a say in claiming fraud on the part of those who file claims. 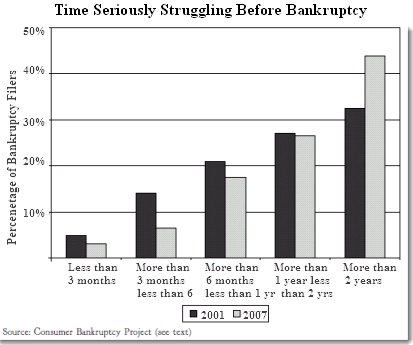 Significant delays in filing for bankruptcy became the norm. Time is money for loan servicers. A long delay before a bankruptcy filing, allows servicers the opportunity to add on special fees, many of which the borrower can’t comprehend. One thorough study showed that many of these fees were questionable. The longer it takes, the greater the revenue opportunities. Delay benefits creditors since loan payments continue at their original level. What happened to those big spending, reckless bankruptcy abusers that were the rationale for the 2005 reforms? The following graph from theConsumer Bankruptcy Project shows that there is virtually no difference between the incomes of filers before and after bankruptcy reform. The majority of filers made between ten and forty thousand dollars a year before reform. That has remained virtually unchanged. The big spending abusers were and remain a mythical construct; the centerpiece of a diversion strategy to keep attention away from this never-ending gift to creditors. Prior to the new law, the major cause of bankruptcy stemmed from medical care expenses and the resulting disruptions to families. Rather than the mythical big spender contrived by Congress, for nearly half of filers, major medical expenses, family tragedies, were the tipping point to a loss of financial viability. 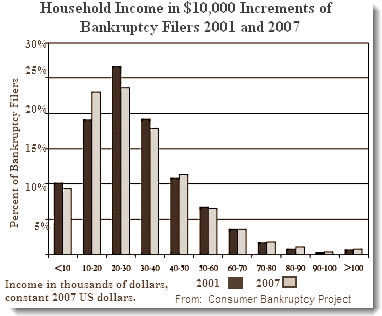 The Consumer Bankruptcy Project audited a representative sample of bankruptcy filers in 2001. The audit found that 46% cited a “major medical cause” for bankruptcy. This includes the direct cost of uncovered medical bills for major illness or injury, lost work due to the same, and the need to mortgage the family home to cover medical costs. Did Congress review this data? Were they intent on making it harder to file bankruptcy as a result of illness? When bankruptcy is delayed or simply not attainable, less money is available for needed medical care. Were the members supporting bankruptcy reform indifferent to the suffering compounded by their thoughtless legislation? The situation is worse now. 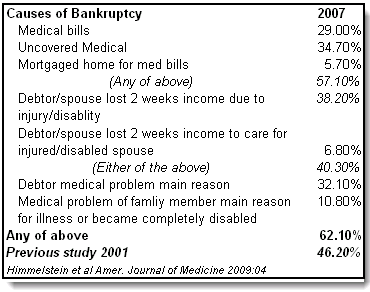 A comprehensive survey of those who filed bankruptcy in 2007 showed the increasing desperation of those faced with medical problems. When individuals or family members are in dire need of medical care, do they just sit home and suffer? The results of this survey show that two thirds of bankruptcies result from medical care that they can’t afford or losses in income from medically required leave. Where are the big spending cheats? The big banks, Wall Street, the politicians they own, and the Federal Reserve Board created the real estate bubble in bad faith. when homeowners hit the wall, to maintain viability for their families, they would need relief of some sort. What did the nihilists of the financial elite and their hit men walking the halls of power do with all this knowledge? They went ahead with the real estate bubble, fostered it, deregulated meaningful controls on the financial industry, and crafted a new bankruptcy law to stick it to filers. They knew or should have know that data from 2001 showed a very high rate of filings due to the financial stress of medical care and crises. Did they care? Do they care now? Has anything been done to correct this injustice? While citizens suffer in financial distress, often due to illness, at the behest of influential bankers and investors, the Department of Justice crafts a settlement with lenders and their representatives to relieve them of the stern justice due for their specific crimes and the larger horrors they visit upon citizens, all in the name of short term profit. We are most emphatically not a nation of laws. We are a nation where the law is used by a very few for their own purposes, without regard for the well-being of the nation or its citizens. We are a lawless nation.